"All animals are equal. But some animals are more equal than others." Tamsin Greig, Nicky Henson, and Toby Jones star in this new drama, part of BBC Radio 4's The Real George Orwell season - a Radio 4 journey that explores the disjuncture between the man who was Eric Blair and the writer who was George Orwell. Great audio excellent performances and unforgettable satire by the master of the paranoid realists. I have listened to this multiple times. The animals revolt against the humans led by the pigs is successful. There is happiness, there is joy, a new day is upon us. Then the slow slide of the new leaders into the same positions once occupied by those who came before them. 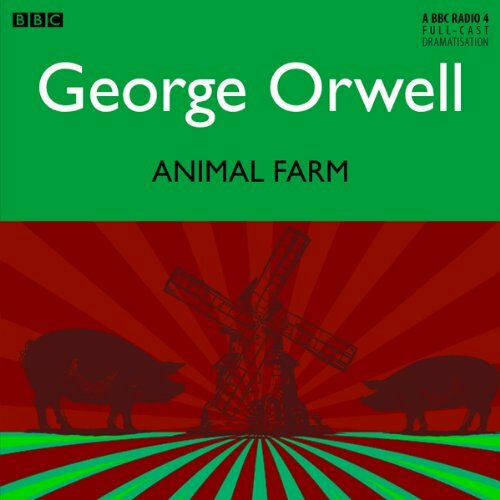 Animal Farm was George Orwell's take on the Bolshevik revolution; the socialists overthrow of the Tsar and his government. Absolute power corrupts absolutely and the leaders of the Russian people have traditionally been authoritarian. Animal Farm tells the story of the slow slide of the revolutionary who frees the people into the reactionary who enslaves them even deeper than did his predecessors. An excellent classic that holds up quite well. This was a beautifully performed version of Orwell's claasic novel. This would be a very easy way to introduce this worl to children who might not be great readers. Or, indeed, to adults. A very approachable adaptation and highly recommended. Somehow I had managed to spend my entire life without reading this classic. It's short and to the point. I'm not sure how this dramatized version differs from the original but I suspect the story lines and dialogue are similar. I'm glad this was short because I don't think I could have listened for several more hours. I did, however, like the dramatized version, replete with sound effects and murmuring. Made it a little better. I've listened and I can cross another classic off my list. Don't think I'll tackle 1984. 8 sur 13 personne(s) ont trouvé cet avis utile. I don't like the accent that the story is told with. love the book, just want to hear it with an accent i understand better. Dramatised version is very well done and is fun to listen to. Enjoyed every bit of it. Great Book. Great Point. What makes this read so fun, is the characters "animals" are acted out. Different voices etc!! love it! Narrators are amazing! love the songs also.The story is awesome,make me thinking alot.